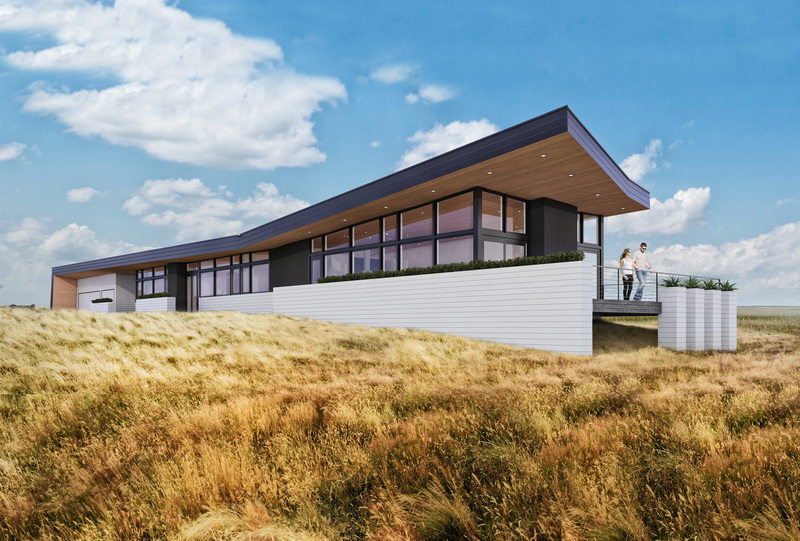 Located in the plains of northern Colorado on a private peninsula, this modern, open, airy home takes inspiration from its beautiful surroundings. A strong sheltering roof anchors the building on the west side, protecting it from the harsh prevailing winds, and opening up to the reservoir that surrounds it on the other three sides. The building is kept simple to emphasize the sublime panoramic views, and inside, the open-plan living area features sliding glass doors that create an indoor/outdoor living experience. The house is positioned to maximize passive winter heating, and the overhang protects it from the summer sun while also allowing plenty of natural light to pass through the large floor-to-ceiling windows.